4 Slack bots disrupting the enterpriseConversational interfaces have become increasingly common in daily life, from consumer bots on Facebook to Alexa and Google helping us at home to Slack bots that make our working lives easier and more productive. To understand more about the products helping shepherd conversational UI into the enterprise, I interviewed four companies that are preparing to pitch their products on stage at Slack's Frontiers conference. Would you recommend Memo.AI to a friend? @mirceap @users I can't find any description of how to use memo.ai to share links. Are they treated as content in notes? That's it? Hi @stoweboyd ! We actually display the title and description for links and Slack files like here: but it's turned off for the launch because we were still fixing some bugs. We're turning this on for everybody this week, but I can turn it on now for you if you'd like! Two of the smartest founders I know are back at it with Memo, a note-taking app that's built right into Slack. Great post on building this + the challenges of building for Slack here: https://blog.memo.ai/10x-your-sl... These guys built on top of Twitter back when that was cool. Mircea & Cristian, what is it about building products that work well on larger platforms that keeps you doing it? How do you navigate the risks of building on top of emerging platforms? And having first released Pogo, what made you pivot towards Memo? Thanks @dshan for the kind words! ❤️ The tl;dr behind our pivot from Pogo (a Slack bot) to Memo (a note-taking app integrated with Slack) is that bots and conversational interfaces are deeply limited, and that more often than not interactions are better done through GUI than language. 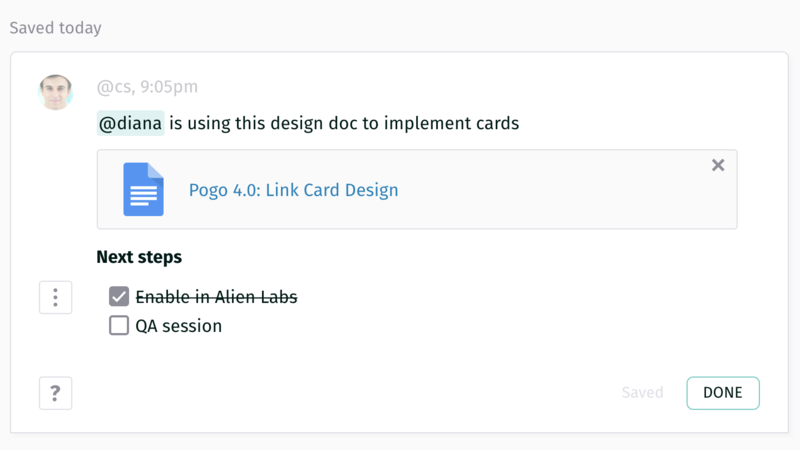 We go deeper into that on our blog: https://blog.memo.ai/pogo-web-ap... Great question regarding building on top Slack! Besides the distribution potential, we think it's worth the risk for two reasons: 1. B2B software doesn't have the same network effects as B2C software, so it's unlikely that any player will have a monopoly on the market (like Facebook has for example). Basically, there will be multiple players in team communication (Microsoft Team, Hipchat, etc.) and in productivity in general (Google Apps, Dropbox, Github, etc.) and we plan to integrate with each of them (we started with Slack, since that's what we use day to day). 2. For now they have a very clear and consistent platform strategy (public roadmap, ideas, etc.) that is fundamentally aligned with their business model. More integrations are good for Slack since it makes their product stickier, but, since they don't make money off ads, they're not competing with developers for attention (unlike social media). Hi @bmehling , we haven't looked deeply at Hipchat, but we do plan to support it later down the road. In the short-term, we'll add support for G Suite and GitHub login, do you use either of them? @bmehling Yeah, Hangouts Chat looks very promising, I'm not sure if they have a developer API yet though. As soon as we get access to it, we're going to investigate and see how deep an integration we can build. Love this. Biggest problem of Slack vs email/Asana is that things quickly get lost. Memo does a really nice job organizing everything. Keep building and I am excited to see this grow!! That's great to hear, thanks @tjcsmyth! Let us know if you have thoughts or questions. @tjcsmyth Can you tell me a bit more about your experience losing things in Asana/Slack? Congrats on the launch Mircea and team! Thanks @pkwire, the team appreciates the support!